Magnificent and exquisitely appointed 3 level Colonial located on a large corner lot. VIEW THE 3D/VIDEO VIRTUAL TOUR! ITS A MUST SEE!. 3100 finished sq. ft. on upper two levels plus a finished walk out basement. Close to 4500 total sq. ft. with upper level-finished basement and unfinished storage area. Large.42 acre Lot. 2 Car Garage. 5 Bedrooms. 2.5 Bathrooms. Premium Azek rear deck 30 x 14 with Retractable Sunsetter 20 x 14 LED lite awning. Premium Azek front sitting deck porch 34 x 12 with LED bench lighting. Executive chef kitchen with: sub-zero cherry panel front 36~ x 84~ Fridge & freezer, built in Wolf microwave, and Wolf double oven, Wolf 5 burner gas cook top with built in pot filler, Miele dishwasher with cherry panel front, U-Line build in wine fridge, instant hot/cold water dispenser built in at sink, and exotic granite counter tops with full size cherry hardwood cabinets. Premium hardwood flooring 1st level, hand scraped maple wide plank flooring in living room and dining room, and oak flooring in family room. Premium hickory hardwood flooring second level, master and three bedrooms. Tiled four Season Sunroom with panoramic windows and Hunter Douglas retractable shades. New carpeting basement, stairs, hallway and 5th bedroom. Replacement windows whole home, and vinyl crane board siding. Extra wide gutters with leaf guards. Custom clothes shelving built in for 5 closets. Custom built in cabinets and book shelves surrounding gas fireplace. Master Bath-Expansive open entry tiled double master shower. Tile Flooring. Granite Counters. Extra deep bath tub in second bathroom. Expansive corner fence lot, with hundreds of perennial flowering plants and lilies. Second floor Laundry. Finished walk out basement 24 x 18, with expansive separate storage areas. Custom Provia entryway doors to front and rear deck, and decorative stain glass sliding door to rear deck from dining room. Easy access to FFX Parkway and Metro. 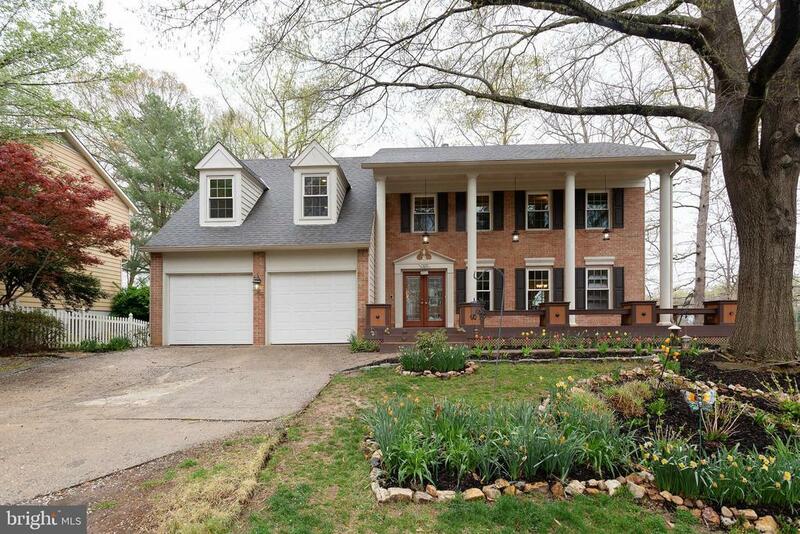 Easy Commuting: Close to Ft. Belvoir, Metro, Springfield Town Center, County Parks. A remarkable home. Directions: I95: West Fairfax County Pkwy. Left at Old Hooes Rd. (opposite Whittlers Creek), Immediate Left Hooes Rd. Right Walnut Knoll.